Doncaster Rovers boss Grant McCann feels his side will relish the big occasion when they face Oldham Athletic for a place in the last 16 of the FA Cup tomorrow. 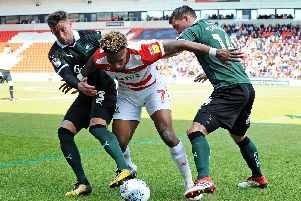 Rovers are bidding to reach the fifth round of the world’s most famous knockout competition for the first time since 1956. The Latics will be backed by almost 4,000 travelling fans and Rovers, who have reduced ticket prices, are hopeful of a big attendance at the Keepmoat Stadium. McCann is confident his players will feed off a big game atmosphere. “Obviously there’s going to be a big crowd here, which is good,” said McCann. “The boys will enjoy the environment and the pressure of it. “I feel like I’ve got a changing room who like the big games and the big occasions – like the Sunderland game down here earlier in the season. “Hopefully we can put that into place on Saturday. “It’s a chance to get to the fifth round and hopefully draw one of the big boys. “Oldham will be thinking exactly the same. It’s a game that both sides will think is winnable. “They’ll be thinking the same as us having gone to Fulham and won in the last round. “We know we just can’t turn up and win. We have to be bang on it. That’s been our focus this week, getting back to where we can be in terms of our performance. With Andy Butler suspended, centre back Paul Downing is set to go straight into the side after joining on loan from Blackburn Rovers until the end of the season. “Paul brings us real experience and composure at this level,” said McCann yesterday. “We've seen his qualities today in training, his calmness on the ball and the way he reads the game. Joe Wright was due to resume full training today but the centre back will not be ready to start a game for 3-4 weeks. Midfielder Herbie Kane is expected to return to the side after missing last weekend’s 2-2 draw with Burton Albion with a groin injury.